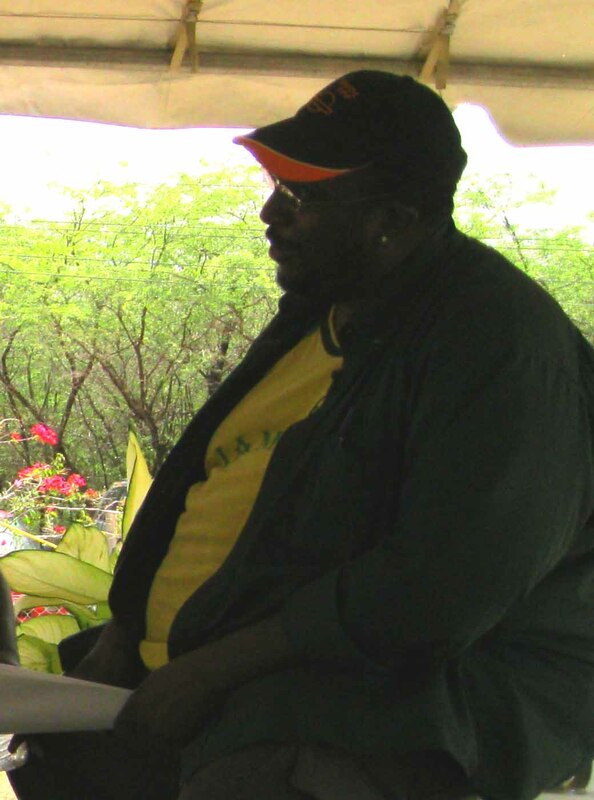 Shelter, as basic human need, piqued the interest of playwright Aston Cooke for his major work for the Jamaica 50 celebrations – the musical Junkanoo Jamboree. The manuscript taps into matters of natural justice and takes on the technical aspects of land ownership through the dynamic medium of the Junkanoo – a Christmastime street spectacle in Jamaica. Playwright, Aston Cooke, with actors Dahlia Harris, Dorothy Cunningham, Akeem Mignott, Fabian Brown. The four scenes read at the Two Seasons Talking Trees Literary Fiesta on February 25 were by actress and playwright, Dahlia Harris; actress, Dorothy Cunningham; Edna Manley School of Drama student, Akeem Mignott; and theatre practitioner, Fabian Thomas. The production is due to raise curtains in May, featuring The University Players. Cooke describes the script as being a slice of Jamaican life set in the rural fishing district Junkanoo Beach Village which is populated by the dignified poor who live in small, but well appointed, wooden houses. There is a proud but dying tradition of Junkanoo costume making in the village. Using humour to keep the audience close to the serious issues, Cooke introduced a plot fraught with tension between proud leaseholders on the beachfront settlement, Junkanoo Beach Village; its indebted landowner, Mrs Terrelonge; and owner of the nearby Quadrille Heights Hotel, Mr Buckingsworth, who corrupts public officials in his scheme to acquire the land. Gender was another sub theme from the selection. The sustaining spirit of Junkanoo is the female spirit, Mamma Lundy, yet the costume players must all be men and the characters lament the shortage of good, strong men to competently play Junkanoo. Intergenerational conflict also beset the trying villagers as the youth say that Junkanoo has no value in these times. There is further intrigue as the best Junkanoo dancer in the village, Trevor, is being enticed by a young lady of Quadrille Heights to dance for them. Two Seasons Talking Trees Literary Fiesta was staged with special partner, JAMCOPY, the Jamaican copyright licensing agency.